After locking out the players last offseason in an attempt to corral spending, NFL owners and their front offices have spent the past 72 hours emptying their pockets to lock up players at the league’s two most fungible positions. Running backs and kickers are essentially renewable resources for teams that are willing to assume even the tiniest bit of risk, but as we hit the deadline for franchise tags, two running backs received gaudy contract extensions and five kickers were locked up by their respective teams’ franchise tag. History suggests, for a variety of reasons, that they’re wasting their money. 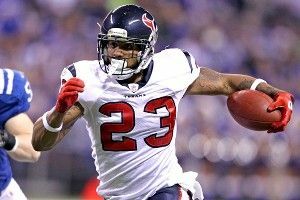 Let’s start with the most notable deal, the five-year, $43.5 million deal given to Texans running back Arian Foster that guarantees the Pro Bowler will receive nearly $21 million. By all accounts, Foster is just about the model football player, with a versatile skill set on the field and a classy, intelligent attitude off it. His production over the past two years ranks with or above any other running back in football, and as we wrote in our agent-style free-agent book on Foster last week, he raised his game when Matt Schaub and Andre Johnson went down with injuries. The Texans really can’t ask for more out of a running back than what they got from Foster these past two seasons. In that sense, he deserved to get paid. The problem with paying Foster, though, is that there’s a salary cap. In a league where you can’t just spend as much as you want on whomever you want, owners and team administrators have finite resources to apply to their 53-man roster. And while Foster’s been great the past two years, that production has come in a system that’s basically served as an assembly line for turning unheralded running backs into valuable properties: The Alex Gibbs zone-blocking scheme, which has done wonders in both Denver and Houston. Denver’s teams under Mike Shanahan played under Gibbs’s zone-blocking system and famously had a history of producing 1,000-yard backs out of thin air. After Gibbs spent three seasons during the mid-aughts in Atlanta with Warrick Dunn as the inherited featured back, he went to Houston and implemented a system that’s worked wonders with Foster and Steve Slaton. In both stops, the zone-blocking system worked with backs who were rookies with limited pedigrees. Terrell Davis stands out as the obvious comp for Foster — unheralded back out of the SEC steps into the starting lineup and puts up numbers like he’s the best running back in football — but he’s also the cautionary tale. Just like Foster, Broncos fans would have rightly made the case that Davis deserved his big money after years of production. After the 1998 season, when Davis went over 2,000 yards and scored 21 touchdowns, the Broncos locked him up with a seven-year contract extension worth $56 million. Davis lasted four games before tearing his ACL and would average just 3.8 yards on his 312 carries before injuries forced his retirement. The Broncos paid Davis as a reward for his past performance and got very little future performance afterward. We’re not suggesting that Foster is about to tear his ACL, but it’s important to note that the Broncos got roughly similar production from Mike Anderson and then Clinton Portis for not much more than the league minimum. What the Texans needed to do was recognize their strengths and weaknesses as an organization and act accordingly. They have a blocking scheme with a long history of producing successful one-cut running backs on the cheap, and in 2009 second-rounder Ben Tate, they have a replacement for Foster on the ready. And if Tate struggles, they should be able to find the next Foster or Mike Anderson or Reuben Droughns available for the league minimum and plug him in. After they spent all that money on Davis and got very little in return, the Broncos realized how to exploit their competitive advantage and traded away Portis after two fantastic seasons. In return, they got Hall of Fame cornerback Champ Bailey and a second-round pick, which was put to use on running back Tatum Bell, who ran for 2,342 yards and averaged 4.9 yards per carry over the next three seasons. Portis only averaged 4.1 yards per pop. In addition, the Texans had little reason to extend Foster on Monday. As a restricted free agent, Foster still had one year left on his contract; Houston could have tendered him a one-year deal at $2.7 million and then matched any contract offer from an opposing team while acquiring the other team’s first-round pick if they declined. (They also could have given him the “exclusive” franchise tag and prevented him from negotiating with other teams altogether.) And by locking Foster up to a long-term deal, the Texans basically punch Mario Williams’s ticket out of town, as it’s hard to see how they’ll be able to afford the unrestricted free agent. Texans fans will now have to hope that the combination of Connor Barwin and Brooks Reed can stay healthy and deliver on the promise they showed in 2011. Ironically, Williams made his way to Houston in 2006 as the first overall pick in that year’s draft because the organization didn’t want to commit serious resources to a running back, Reggie Bush. In 2012, Williams is probably going to be leaving Houston because the organization finally decided to do so. Seattle beat Houston to the punch by signing Marshawn Lynch to a four-year deal worth $31 million that guarantees him $17 million. As you may remember, the Seahawks acquired Lynch in 2010 for a pair of mid-round picks because the Bills had grown tired of the former first-rounder’s poor attitude and middling play before selecting Clemson back C.J. Spiller with the ninth pick of the first round in that year’s draft. As an addendum to our previous section, note that both Lynch and Spiller have been outplayed during their respective careers by undrafted free agent Fred Jackson, whom the Bills signed out of a career in indoor football and NFL Europe. That’s right; this year, Lynch suddenly developed into a great goal-line back, doubling his career high. After requiring an average of 37 carries to score a touchdown before 2011, Lynch was showered with Skittles once every 23 carries during the past season. What are his chances of doing that again? Well, since the merger in 1970, there have been 82 backs who fit Lynch’s 2011 scoring profile, scoring rushing touchdowns at a rate between 21 to 25 carries per score over a 200-carry season. In the season afterward, 47 of those guys got 200 carries again. They scored touchdowns at a rate of one per 35.6 carries, or exactly where Lynch was before last season. Perhaps Lynch has really matured and improved since arriving in Seattle, even if that improvement didn’t show up during a dismal regular season in 2010. The Seahawks could have found that out by slapping the franchise tag on him and making him prove it to them for another year before giving Skittles a long-term deal in 2012. Instead, the Seahawks have locked up a player who seems unlikely to reach the same heights of one year ago. Meanwhile, kickers everywhere are being barred from free agency by their organizations, with no fewer than five teams essentially ensuring that they’ll keep their kickers in 2012 by sticking the franchise tag on them. The fact that they’re insistent upon paying a premium for the guys they had last season shows a depressing level of knowledge about the game among decision-makers in front offices. The reality is that kickers just aren’t consistent from year to year. If kicking were a consistent skill, guys who are scary accurate in one season would also be at the top of the leaderboards the following season. Research has shown that not to be the case. Here’s a simple chart we put together, consisting of every kicker since 1999 who attempted 20 field goals or more in each of two consecutive seasons. You’re about to realize just how maddeningly inconsistent placekickers are. Look at that chart again. That’s crazy. If you take the league’s most accurate kickers in a given season and compare them to the NFL’s least accurate ones, the least accurate kickers are better on field goals in the subsequent season. Of those 41 kickers who had seasons where they converted 89 percent of their kicks or more, just four of them repeated the feat in the following year. The reality is that kickers don’t have a big enough sample size in a given season to exhibit a true level of ability; think about how accurate or inaccurate a quarterback can be in 30 pass attempts, or how a .300 hitter can go 2-for-33 and nobody blinks an eye. That’s a full season for a kicker. You’re better off using a kicker’s performance over three or four seasons to judge his true level of ability. And yet, NFL teams went out and locked up the league’s most accurate kickers on Monday. Connor Barth (92.9 percent), Josh Scobee (92.0 percent), and Mike Nugent (86.8 percent) were all guaranteed salaries in excess of $2 million despite the fact that there’s virtually no evidence suggesting that they’ll repeat that level of performance next year. While Scobee was at least fifth in touchback percentage on kickoffs, Nugent was 19th and Barth doesn’t even kick off for his team. Even scarier is that two teams franchised kickers who didn’t even have good seasons. Broncos kicker Matt Prater led the league in touchback percentage, but he also spends half his season in the thin air of Denver. He produced a touchback on 30 of his 33 kicks at home during the regular season, but on the road, he only forced a touchback on 18 of his 36 attempts. That 50 percent rate would be good for just 14th in the league. And as a kicker, while he had a pair of game-winners as part of Tebow miracle games, his 19-for-25 season rated out as 28th in the league. (And no, it wasn’t because the thin air forced him into impossible kicks; Prater was 3-for-4 from 50-plus, but just 3-of-7 from the 40-49 range.) And Browns kicker Phil Dawson was franchised despite ranking 19th in field goal accuracy and dead last in touchback percentage. Because he was franchised last year, Dawson will receive a whopping $3.8 million in 2012 after serving as a below-average kicker in 2011. These signings are another reminder of just how spectacularly risk-averse NFL teams are. Teams are shelling out significant money to exactly the sorts of players who are easiest to replace, just because they’re worried about the unknown. There’s no guarantees that any of these deals will work out and significant evidence that they’re likely to fail. The Steelers and Bengals paid for peace of mind when they franchised Jeff Reed and Shayne Graham in 2010 and 2009, respectively, and got awful results; Reed was released halfway through the year, and Graham missed two crucial field goals in the playoffs against the Jets. The Broncos rewarded a deserving Terrell Davis in 1999, but the money went for naught and his performance was quickly replaced. Good franchises go to the well for undrafted free agents and cheap rookies and realize that there’s talent to be had at certain positions in the well. Naive franchises go to the well, find talent, and spend lots of money to ensure that they’ll never have go to the well again. All they’ve ensured is that they’ll go back to the well with lighter pockets. Do Trade Rumors Help Rajon Rondo?